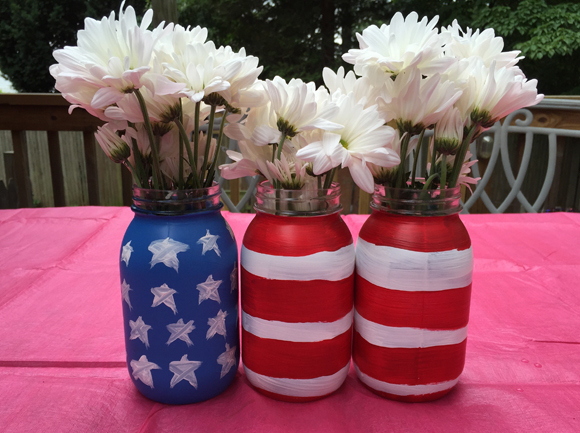 less is more: patriotic mason jar floral centerpiece. patriotic mason jar floral centerpiece. I saw this mason jar centerpiece all over the place when I was looking for Fourth of July things on pinterest, and fell in love. It was a super easy DIY — all you need is three mason jars, red, white, and blue paint, and some beautiful flowers. I painted one jar blue and the other two white, then when they were all dry I painted white stars onto the blue one (not well, I might add), and red stripes to the white ones (also, not well). If you care about it looking neat and polished, I'd recommend taping off the white for the stripes and using a stencil for the stars, but I kind of just went at it with all the wrong size brushes, and I'm into the imperfect way they turned out. I bought white daisies to put in the jars — one of my favorites — and called it a day.